Happy April! Between the early deep freeze on the East Coast, the once in a lifetime building flood and the quick succession of four Nor’easters, we had quite the winter. Through it all, we came together as a company, and I saw the power of community on full display. We’ve been building community for over 20 years as a company for people who follow the Blood Type Diet and other personalized programs that Peter has developed. We started out with the D’Adamo Forums, long before online social interaction like Facebook existed, and from that starting point have built bigger communities, websites, and overall outreach via our newsletters, conferences, and real human customer service associates, something rare in this day and age. Through the strength of community building, we found a dedicated and ever-growing community of like-minded people, and it is the strength of this connection that has allowed the concept to grow and flourish. I recently saw an article about Mister Rogers and the powerful message his program had for young people and their parents too. He was such a humble, decent person and his magic was building a community that was inclusive, supportive, caring and kind. There are so many take-aways from his work, however, three key elements stand out as keynotes for the work we do and the community we are part of, and I wanted to take a moment and share these with you. Understand that everyone has their challenges, so be kind to all. This is invaluable as a life lesson, and it is as important in the office as it is in our BTD community. Don’t obsess over being perfect. There is no such thing as perfection, just do the very best that you can do. Have a great April! Spring veggies abound. 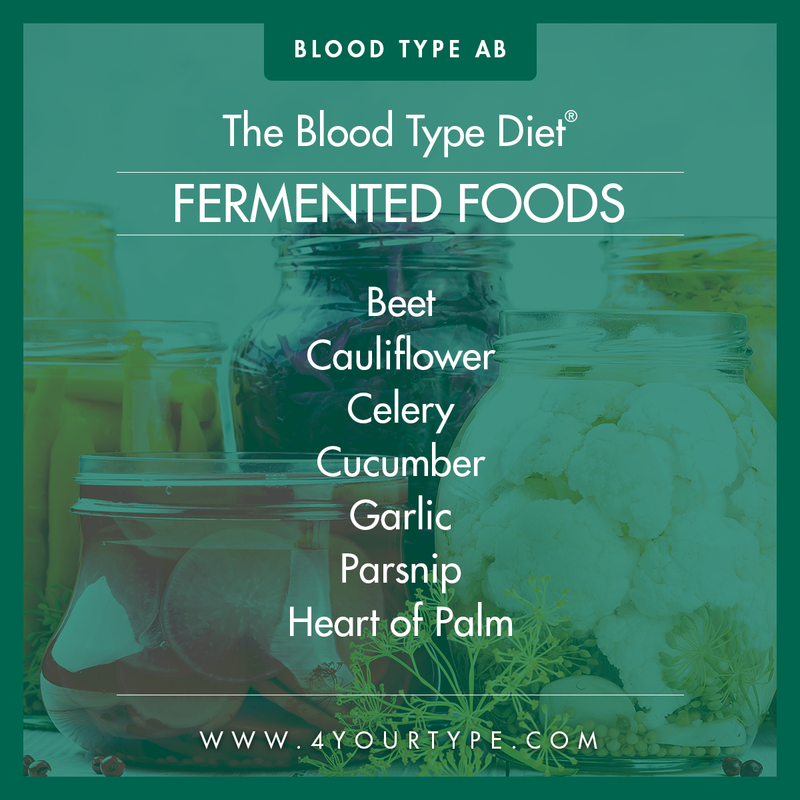 Be sure to check out our article on fermented foods and quick tips on doing this at home in a Blood Type Diet friendly way. The Blood Type Diet is a great way to reduce inflammation and maximize health. Much of this has to do with lectins, the carbohydrate-binding molecules found in so many different foods. These lectins may react badly with one blood type but have no effect on another. The Blood Type Diet removes foods that are difficult to digest or that contain harmful lectins for your type to alleviate the stress on your body. 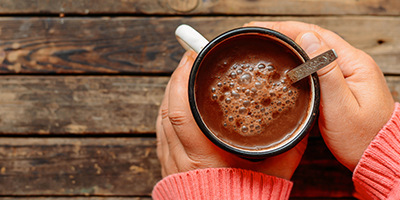 Patients and followers of the diet always have questions about certain types of foods. 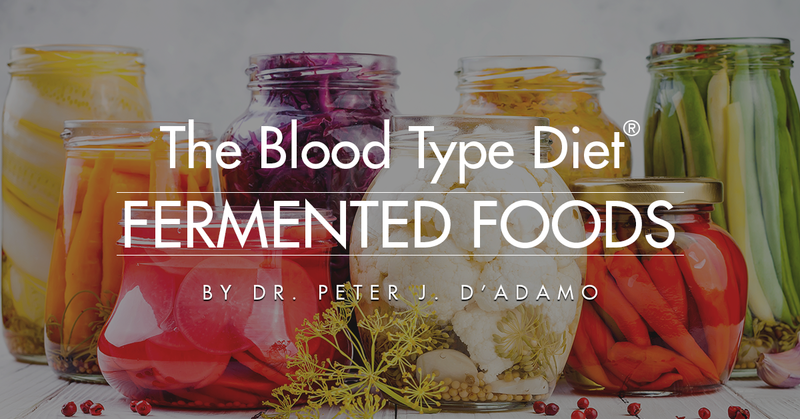 As the years go by, different fads hit the mainstream, causing many people to wonder if those foods would be helpful for them on the Blood Type Diet. One category of foods I have been asked about a lot recently are fermented foods. The fermenting process has been around since as early as recorded history and is defined as “the chemical breakdown of a substance by bacteria, yeasts, or other microorganisms, typically involving effervescence and the giving off of heat.” The process is most notably used to make alcohol and preserve vegetables though it is also used to make yogurt, cheese and salami, among many other things. It’s actually quite a simple process to do in your own home that only involves a few steps. The steps for fermenting vegetables are listed below. Cut and clean your vegetable of choice, then mix it in a glass jar with 1 tsp of salt per cup of vegetable. Fill the jar with water, enough to fully cover the ingredients in the jar. Make sure the vegetables stay submerged and don’t float up above the water line. If they keep rising, put a small weight in the glass jar to hold them underwater. Use ¼ cup of liquid from a previous ferment per quart of vegetable (if available), or the contents of a probiotic capsule (such as Polyflora), as a starter by adding it to the jar. The starter is not necessary, but facilitates faster fermentation. If you omit the starter, allow an extra day for wild cultures to ferment on their own. The salt will keep any unhealthy bacteria or fungi from growing, while permitting the lactic acid bacteria to thrive. Seal the jar firmly and allow the vegetables to culture at room temperature for 3-5 days, tasting the mix daily to achieve the proper taste and consistency. When the vegetable ferment is done, refrigerate it. In general, fermented foods can be a good thing for your body, as they contain pro and prebiotics, key components in maintaining proper gut health which can naturally deteriorate over time from stress and other factors. 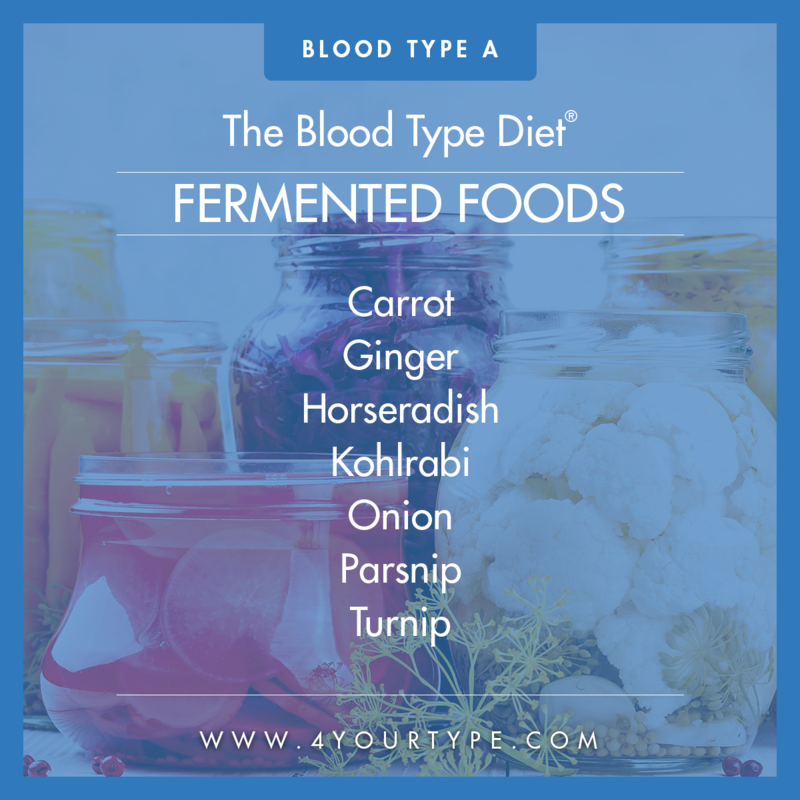 While probiotics and prebiotics are definitely great healthy additions to your diet, they still need to come from Blood Type Diet compliant sources. It’s important to always adhere to the right options for your blood type, regardless of what trends say about probiotics, Omega-3’s, or any other flavor of the month trending nutrition topic. Also, be wary of added sweeteners or other ingredients (such as vinegar) in bottled or pre-packaged varieties of fermented foods, a good practice for not just this category of food, but any product you buy that uses multiple ingredients. You would be surprised how many avoids can be lurking on labels of pre-packaged goods. While some pre-made fermented foods can be question marks because of their ingredient lists, there are some fermented foods which are easy to define by Blood Type Diet values. Cultured soy foods, such as tempeh, miso, and natto are beneficial options for Blood Types A and AB, as these types thrive on soy. Yogurt and kefir are beneficials for Bs and ABs and are avoids for Os. Red wine, one of the most popular fermented foods, is neutral for all types, while white wine is only an avoid for Type O. 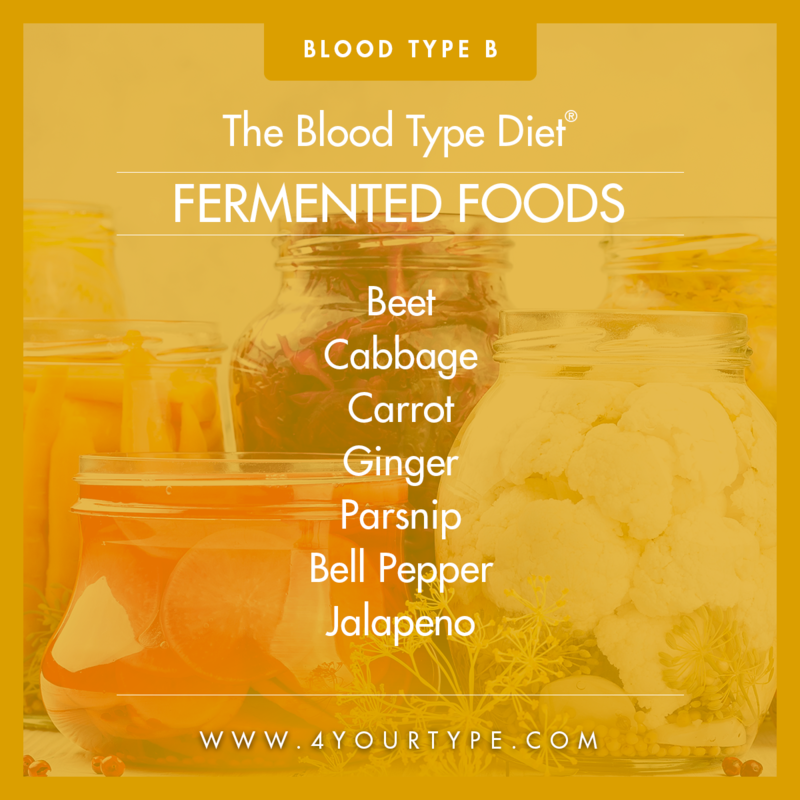 If you are looking for some fermented options that would work for you, we have some great blood type specific fermented vegetable choices below that are simple to make at home with the aforementioned 3-step process. Remember, virtually any bean, grain, root vegetable, fruit, spice, or beverage can be fermented. Just make sure you're starting with an ingredient that's neutral or beneficial for your blood type. If you are adding any ingredients throughout the process, take those values into account as well. To boost the probiotic benefits from fermentation, use a capsule of my blood type specific Polyflora probiotic supplement as the starter for the process, which will also speed up the fermentation and get you those delicious fermented foods even sooner! A special thanks to Louisa Wah, the chef behind the recommendations above. If you are looking to learn more about cooking right for your Blood Type she is offering an online cooking course that will accommodate all skill levels and people who are new to the Blood Type Diet as well. For the past couple of years I had been struggling with what I felt was an immune deficiency, constantly battling recurring bouts of bronchitis, colds, flu, etc. Things finally reached a head when I was diagnosed with a hiatal hernia, and was told that the only way to control it was through medication. 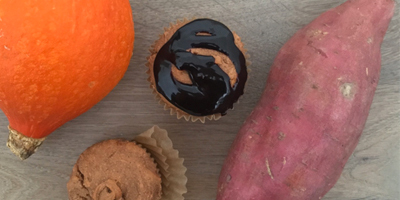 Seeking alternative methods of control, I visited an acupuncturist who recommended that I try this diet – if nothing else, but to aid my digestion. Before reading Eat Right for Your Type, I was eating chicken four to five times a week: roast chicken, chicken soup, chicken sandwiches…well, you get the idea. I thought it would be difficult to cut chicken out of my diet, but I started eating lamb in its place. While I didn’t start this diet to lose weight, I lost about ten pounds in two weeks, and this is without following the recommended portion size. The best thing, however, is that my overall health has improved. I no longer go through the day feeling like a slug and people tell me they can see the difference in my energy level. I am now down to a weight of 142 pounds, the same as when I graduated college. 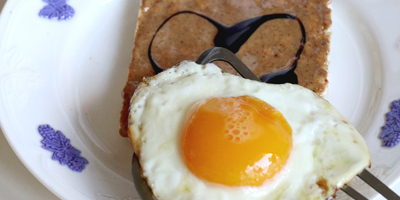 This is without even attempting to cut back on calories. While I was never considered overweight, people tell me they can see a big difference in my weight. The most amazing part is that now my body feels that it can fight off common ailments. Used to be that when I started getting a cold, there was no way to avoid it. Then I would be in bed for a few days. The last couple of times I started getting sick, I expected to wake up the next day feeling terrible. Amazingly, I would wake up and my symptoms had all but disappeared. Even with the results that I’ve gotten, some people are still skeptical. But who cares, I say! I feel great and I won’t have to worry about my belly hanging out when we go to Hawaii on vacation! 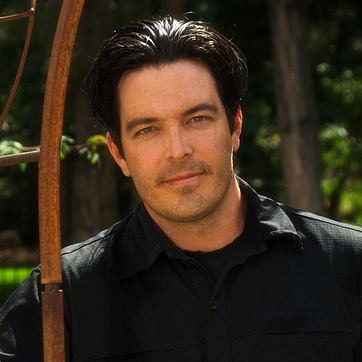 While many people know me as a doctor and the author behind Eat Right 4 Your Type and the family of books associated with it, many people don’t know of some of my other hobbies and interests. One of the biggest passions of mine is to work with software. I am a self-taught software developer who became interested in the field and dabbled until I learned how to create my own programs. I found myself enjoying the process, with each fragment of code like a single piece in a jigsaw puzzle, just looking for its place in the bigger picture. The holistic approach good coding takes has more in common with medicine than people think. Perhaps that’s how I took so naturally to it. Over time, I developed my skills and was able to create my own software, including SWAMI XP, a program that personalizes your diet beyond even the Blood Type or Genotype Diets, and Opus23, a suite of apps for medical professionals used by over 200 clinicians worldwide that provides them with a collection of unprecedented tools that help to personalize the care they offer their patients. It is with great pleasure that I share with you one of my favorite pieces of software I have developed: The D’Adamo Supplement Advisor. The D’Adamo Supplement Advisor might sound familiar to some of you, as it was a tool that has been available on 4yourtype.com for some time. For those of you who have never heard of the program, it is a simple set of entry forms that lets you input basic information about yourself including what you are looking to get from supplementation that will then tell you which of our products best suit your needs. While this has been on the site in the past, I've worked extensively in revamping the look and the ability of the program to give you the best results. All the newest D’Adamo Personalized Nutrition products have been added to the database, so the Supplement Advisor can now recommend things it couldn’t before, giving you the most accurate look at the best options for who you are individually. So many times throughout my career, I see people look at a wall of supplement options and wonder what ones are best for them. This application takes the guesswork out of making that decision so you can hone in on what truly matters most to you. Dr. Peter D’Adamo recently shared this article from the Neuroscience News website that talks about a pioneering new study conducted by leading researchers at the University of Sheffield that has revealed the vital role blood type plays in the development of the nervous system and consequently, the risk of cognitive decline. Global Health Corner published an article about the basic tenets behind the Blood Type Diet and some of the guidelines for each type to follow for success. We recently updated our Facebook page’s url to better match our company and make it easier for people to find. 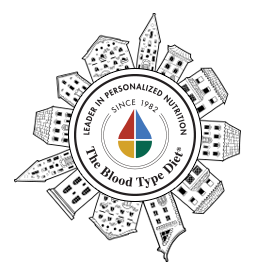 If you had it bookmarked, the new page is now: www.facebook.com/eatright4yourbloodtype. It can still be searched for under our main page name, D’Adamo Personalized Nutrition as well. Louisa Wah, aka the Eat Right Chef, held a cooking class at the Park Slope Food Coop in Brooklyn, NY where she shared general knowledge about the Blood Type Diet and then demonstrated perfect recipes for people to try at home. Flowers are starting to bloom, days are stretching slowly and spring is just around the corner. With brighter days on the horizon, gatherings are welcome, especially for brunch! 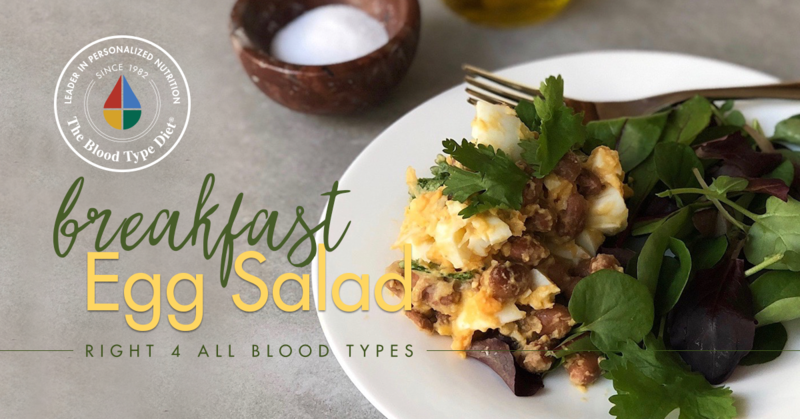 Our personalized cookbooks, available for each blood type, offer a bounty of options like this breakfast egg salad. Easy to prepare for a few people or for a crowd, it's not just a hearty and healthy option, but one that is so tasty, you'll find yourself making it to enjoy any time of day! *Type B substitute kidney beans for black-eyed peas. Type AB, substitute pinto beans for black-eyed peas. Heat olive oil in a small skillet over medium heat. Toast black-eyed peas (or the right bean for your blood type) for 2 to 3 minutes, until warm and slightly crunchy. Remove eggs from shells and use a fork to break the eggs apart in a bowl. Add beans, cheese, and parsley to eggs, and toss with dressing. Serve over mixed baby greens.